"Thomas Bloch is unquestionnably a virtuoso and a musician"
Original works from the 18th century to today with one or several of the rare instruments played solo by Thomas Bloch (glass harmonica, ondes Martenot, crystal Baschet,...) : solo recitals, lectures / concerts, presentation of the instruments in schools, private events for companies... Some recent works may use a playback for pre-recorded electronic parts. 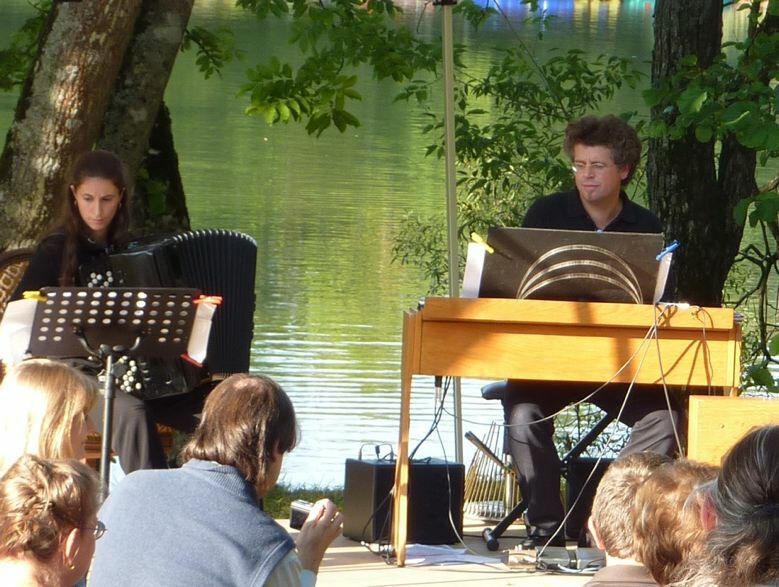 Creation of new works, baroque and classical repertoires with the 430 Hz glass harmonica or the 442 Hz glass harmonica (Mozart, Beethoven, Hasse, CPE Bach, Donizetti, R. Strauss...) and also 20th and 21st centuries repertoires with ondes Martenot and cristal Baschet (Messiaen, Varese, Honegger, Hindemith, Landowski, Bussotti, Scelci, Greenwood...). A duet unique in the world ! 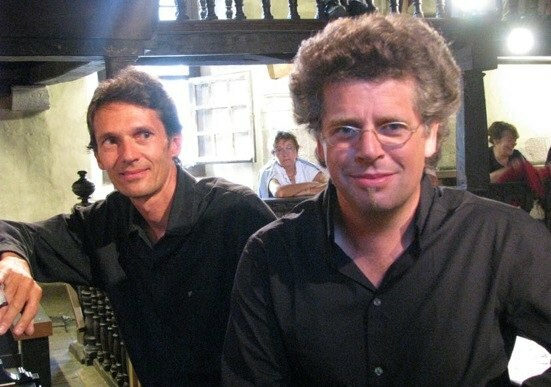 A sopranist (male soprano) and glass instruments : Patrick Husson and Thomas Bloch. The latter can also play the piano or the organ besides his glass instruments in order to extend the repertoire. 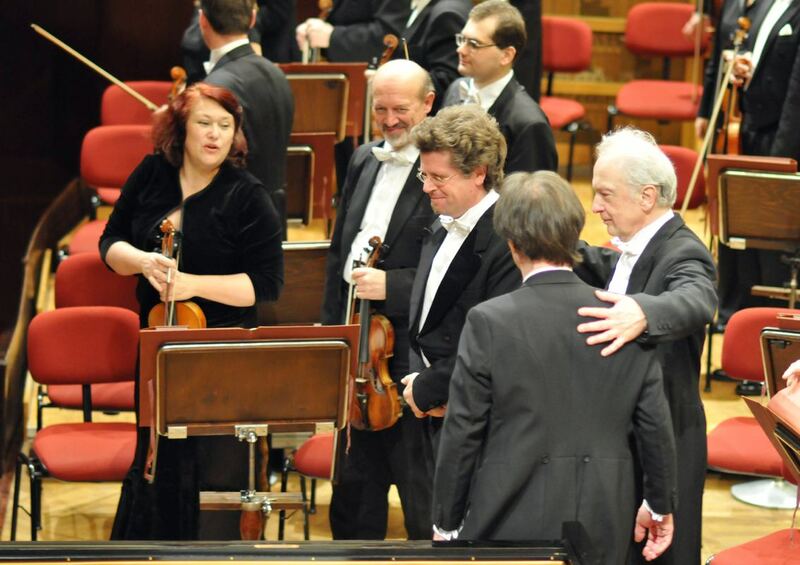 There are about a dozen male sopranos in the world. They are probably the closest heirs to the castrati and Farinelli. Works from the baroque period to today : Mozart, Pergolesi, Broschi, Monteverdi, Haendel, Verdi, Fauré, Bloch, Gorecki, Gershwin... Some recent works may use a playback for pre-recorded electronic parts. It is the only pre-cinema performance in Europe who, by means of a scenario including all the major themes of Phantasmagoria shows how was its practice in the late 18th century and in the 19th century. 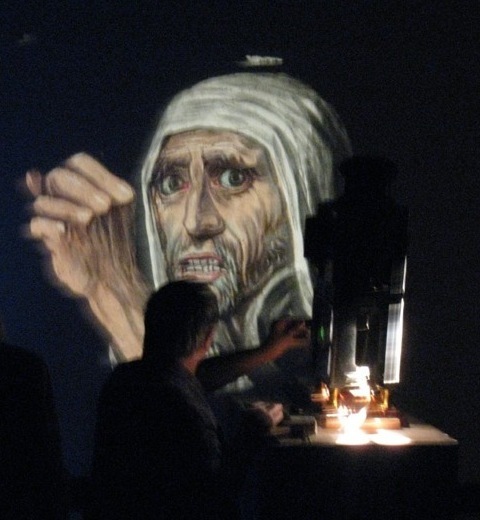 The magic lantern (the one used was made in 1880) and moving hand painted glass plates (from the late 18th and 19th centuries) gives life to evil beings who start disturbing the life of a charming little village. Ghosts, witches, devils, the Apocalypse horsemen and the famous blood-covered nun carry us away into the kingdom of darkness and fear. 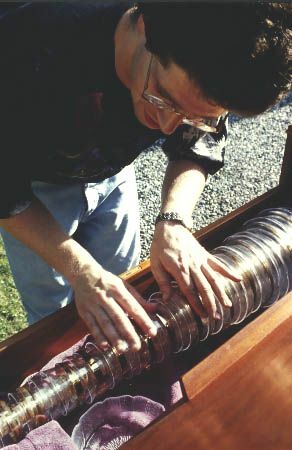 The projections of such films were usually accompanied by the glass harmonica, the nail violin (also called nail Harmonica, an ancestor of the waterphone) and various instruments used for sound illustration. According to Jefferson, "the melodious sounds of Benjamin Franklin's Harmonica contribute powerfully to the effects of phantasmagoria, by preparing not only the minds but all the senses as well for strange impressions". 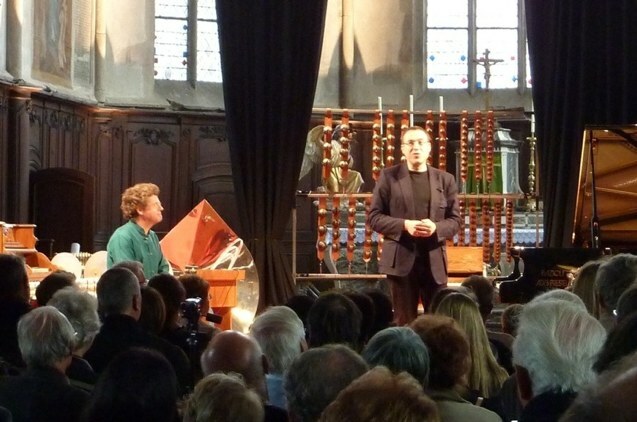 A unique duet with a young harpist who is considered as pushing the limits of his instrument, plays along with a cousin of the glass harp. Works from the 18th century to today, solo and duet : Mozart, Beethoven, Wagner / Liszt, Mendelssohn, Brahms, Fauré, Hindemith, Messiaen, Bacri, Hersant, Redolfi ... Some recent works may use electronics. You can choose to hear the classical harp, or the triple harp (barock) - together with the glass harmonica in 430 -, or the celtic harp, or the electro-acoustic harp. Visit Pauline Haas website here. 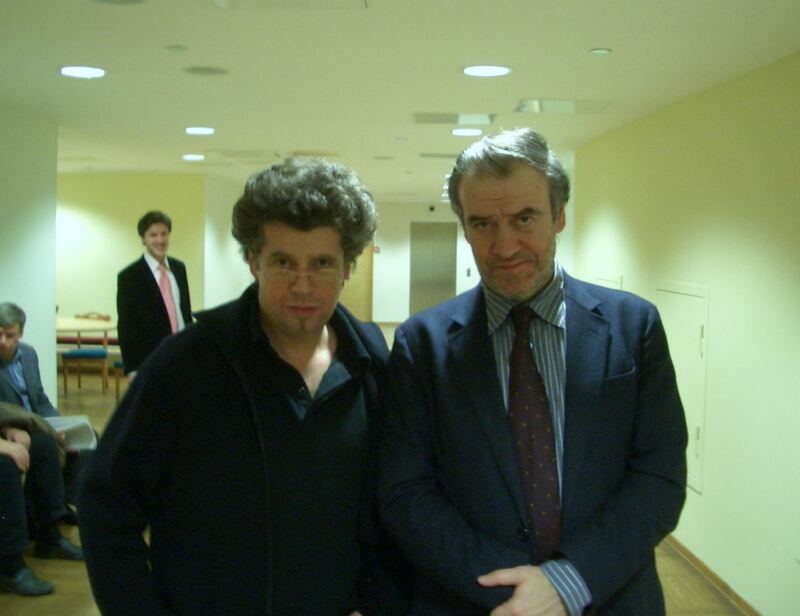 A unique duet with the very first laureate of the recent accordion class in Paris Conservatoire National Superieur de Musique. Works from the 18th century to today and to jazz, solo and duets : Mozart, Fauré, Messiaen, Piazzolla, E. Bloch, Rachmaninov, Cavanna, Dubugnon... Some recent works may use a playback for pre-recorded electronic parts. 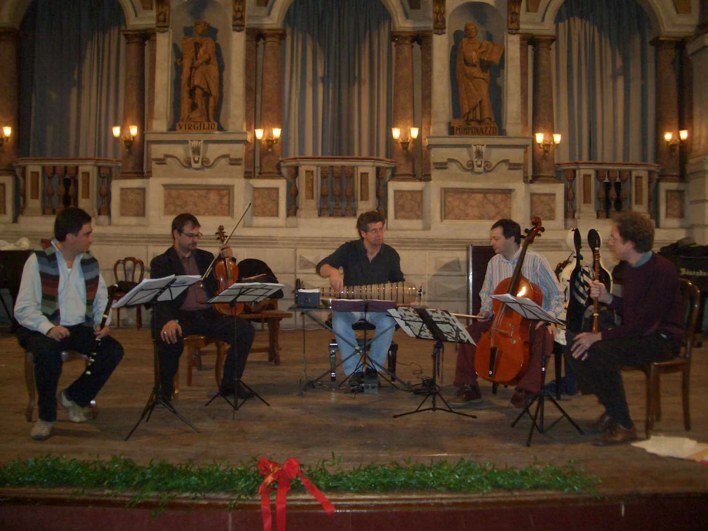 Works from the 18th century to today and jazz, solos and duets. Works for the piano (original works and arrangements of works originally meant for instrumental ensembles) by Mozart, Reichardt, Sombach, Benjamin Franklin, CPE Bach, Fauré, Messiaen, Murail, Wisson, Jolivet, Bloch, improvisations... 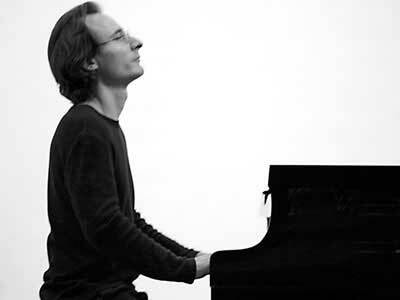 It is possible to play with a pianist Thomas Bloch generally works with or with a musician you'll choose. Some recent works may use a playback for pre-recorded electronic parts. 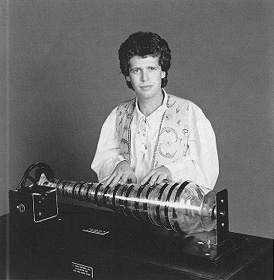 Paganini named the glass harmonica : "an angel organ". It was also sometimes called glass organ. So, the idea of mixing both kinds of organs seemed an evidence. Mozart, Reichardt, Benjamin Franklin, Hasse, CPE Bach, Mendelssohn, JS Bach ... and also the large repertoires for the organ and for the glassharmonica, each played by itself, in a classical and / or contemporary repertoire. 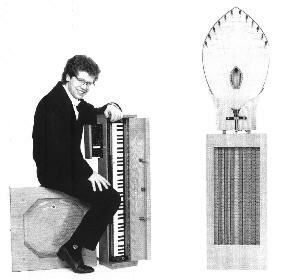 It is also possible to use ondes Martenot with the glass organ or separately. Some recent works may use a playback for pre-recorded electronic parts. 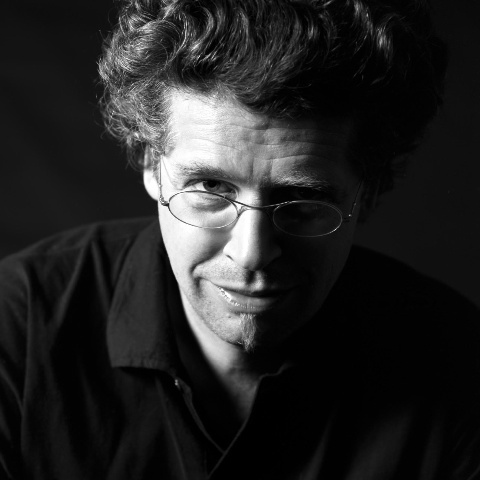 Visit Yves Rechsteiner's website here. Original works from the 18th century to today with the best-known and most inventive Belgian flutist : from Mozart to Piazzolla (who composed his famous Story of the Tango for Marc Grauwels). Some recent works may use a playback for pre-recorded electronic parts. Visit Marc Grauwels website here. The Barytone-violin sounds very much like the viola and the cello put together. It is even rarer than the glass harmonica. Jacques Dupriez plays the only one known today. It was invented centuries ago and was considered as the ideal instrument and supposed to stand between the viola and cello. Of the viola it has the technique and of the cello the depth and power. 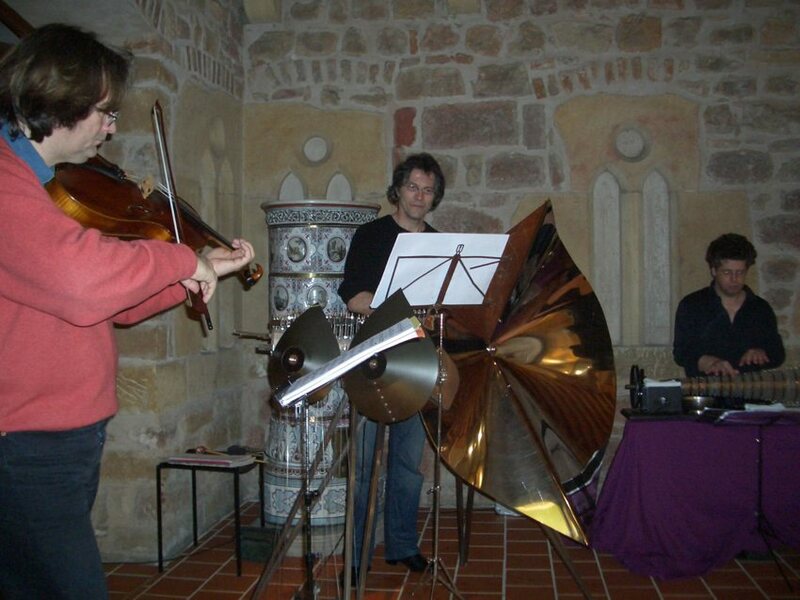 Works from the 18th century to today : Mozart, CPE Bach, Espejo, Bloch, Paganini, Bacri... either with gut strings and the 430 Hz armonica to give a baroque identity or with metal strings and the 442Hz armonica. Some recent works may use a playback for pre-recorded electronic parts. Visit Jacques Dupriez website here. A unique association of three musicians, each of them considered as the best performer with his own rare instrument(s) . The range of the two glass instruments used here is the same as that of a piano. Works from the 18th century to today : Mozart, Reichardt, Paganini, Deneuve, Bloch, Bacri...Some recent works may use a playback for pre-recorded electronic parts. Visit Michel Deneuve's website here. Visit Jacques Dupriez website here. Works from the 18th century to today. 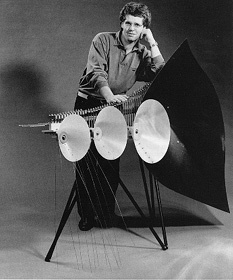 Most of the recent works have been composed by Michel Redolfi for the rare instruments and live electronics. Staging, sound design and possibly visual design for all sorts of places (concert halls, swimming pools - underwater music - , the sea, outdoor places, churches, streets ...). 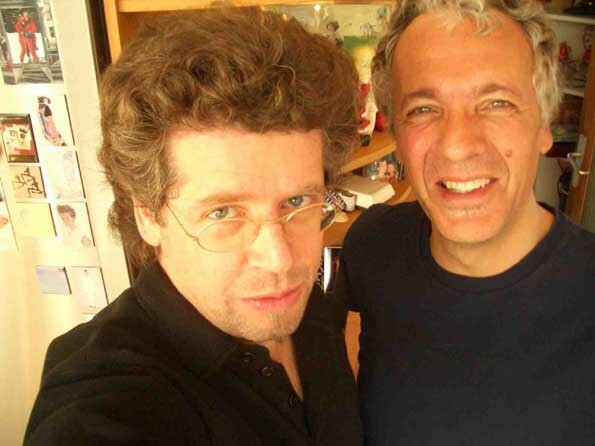 Michel Redolfi is a composer of electronic music from GRM (Groupe de Recherche Musical founded by Pierre Schaeffer and Pierre Henri). He has done research work at San Diego University (California) and invented the underwater concerts (concerts in a pool with special loudspeakers, the audience being only able to hear the music when they are in the water). He also composed and created soundscapes for the largest aquatic parks and more recently for the new tramcar in Nice (France). Visit Michel Redolfi's website here. Experimental music, contemporary music, improvisation. 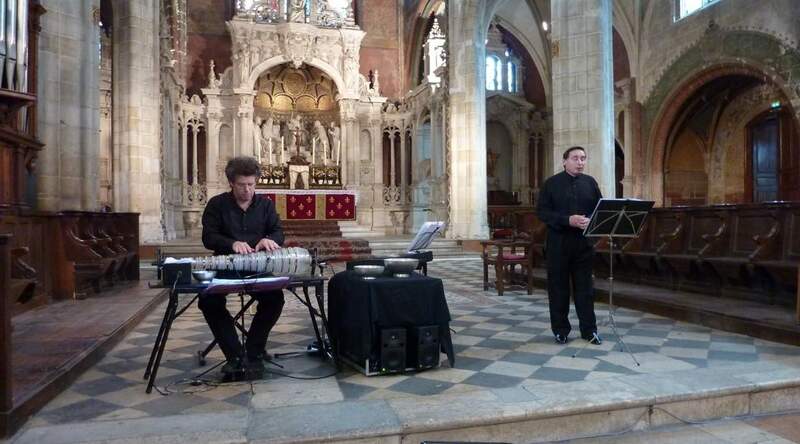 The trio can be associated with other musicians, voices, dance, painting, literature...Some recent works may use a playback for pre-recorded electronic parts. 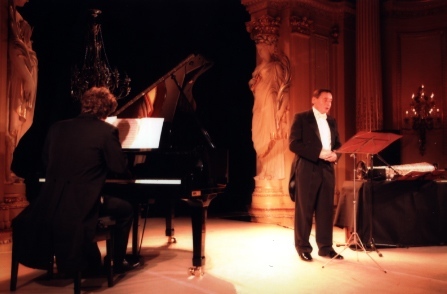 Eclectic repertoire (from baroque to the cabarets of the 1950ies, concert in F by Gershwin, Fats Waller, Messiaen, Britten, Liszt, Chopin, Rachmaninoff, The Rolling Stones...), improvisations, interactive participation of the public (someone is asked to conduct us, other can propose a thema on which we'll improvise in various styles, etc). Some recent works may use a playback for pre-recorded electronic parts. To hear and see Isabelle Poinloup here. 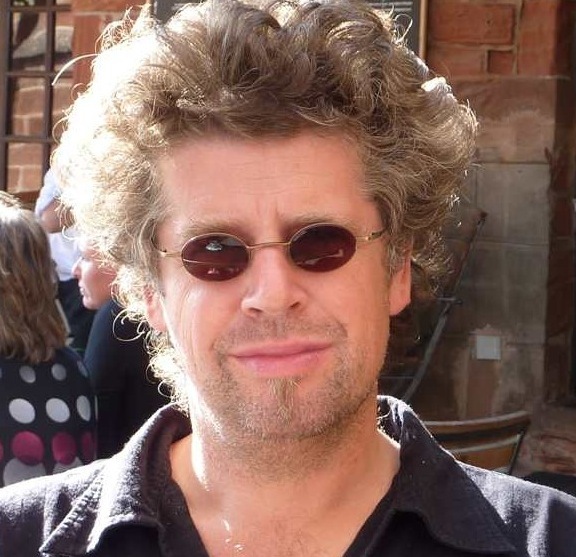 Visit Francois Weigel's website here. A mixture of the repertoires mentioned above - all combinations possible (solos, duets to sextets). 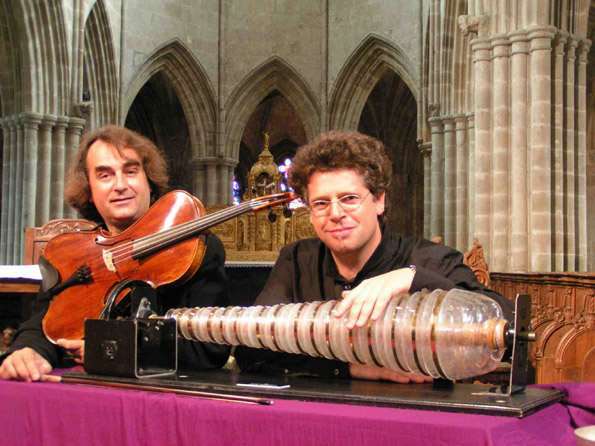 Patrick Husson (male soprano), Thomas Bloch (glass harmonica) and either of the quartets they usually play with (several possibilities) or an ensemble of your choice. Some recent works may use a playback for pre-recorded electronic parts. 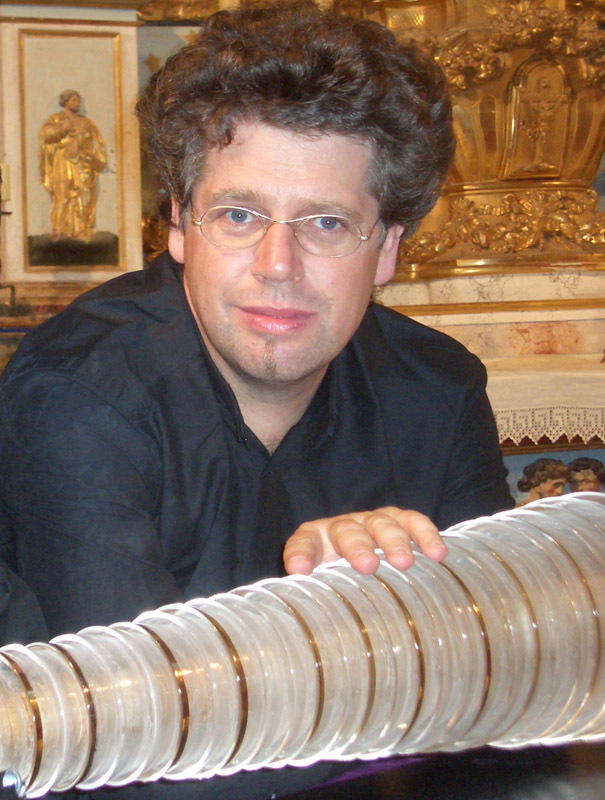 From solo performance to a quintet with the glass armonica : Mozart (Adagio und Rondo K.617 for glass harmonica, flute, oboe, viola and cello), Reichardt, Benjamin Franklin, Hasse, CPE Bach ... to today’s music and also the large repertoires of the quartet and of the quintet, their choice of instruments and musicians depending on wishes and budgets (strings quartet / flute and strings trio / flute, oboe, viola, cello / flute, oboe, strings trio ...). 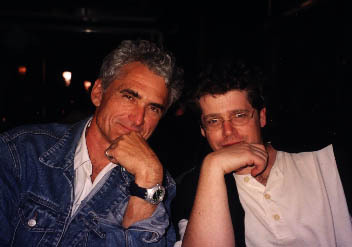 Thomas Bloch may play with the musicians he usually plays with or with an ensemble of your choice. For ideas, you can refer to his biography, to the section "musical partners", bearing in mind that not all the artists have been mentioned and that there are always many other choices possible. Some recent works may use a playback for pre-recorded electronic parts.